It’s funny that I’m “announcing” my book title today. My agent blogged about the importance of a good title today! A bit ashamed, I confess that I was much like the author she mentioned in her blog. My “working” title I didn’t think was very good, but I slapped it on there, knowing a publishing house would probably want to change it anyway. In my defense, when I first wrote my book, I intended it for the “Love Finds You in (insert cool named city)” series. But when I was finished, I just had a feeling it wouldn’t be a good fit for that line. So when I entered contests, I changed the name to “A Sandwich Romance” just for ease sake. Confession: I HATE COMING UP WITH TITLES! Writing the book is fun, but creating a title is mind-breaking work for me. Basically you’re trying to sum up 80-100k words in just a few really catchy ones. Here are a few reasons why I stuck with my working title when submitting though. My book is all about sandwiches. It fit! BUT! I was blessed that my publishing house, Abingdon, looked past a blah title and contracted my book anyway! There was a title, other than my working one, listed on the contract. I quickly e-mailed her, asking if this was the final final title. I was told it was the approved title, but if I didn’t like it, I could offer suggestions and they would take them into consideration. I LOVED that they gave me this option, but the more I thought about the new title, I just felt that it fit. I write funny inspirational contemporary romance (how is that for a mouthful of a genre!) My title is fun and still has the word romance in it! Wahoo for that! Okay, I’ve strung this out long enough. Do you want to know what the title is yet??? It fits because the setting is the small town of Sandwich, IL (where I was born and lived till I was 5, incidentally!) The hero owns an upscale sandwich restaurant. And the heroine finds herself the gooey filling stuck in between her new boss, who she has a senseless crush on, and his fiancee, who despises her and wants to make every moment of her life a living not-very-nice-place. Lots of sandwich drama here! So…. what do you think of my title? For your readers out there… when you go into a bookstore or look on amazon for a book… how important is the title?? What do YOU think makes a good book title? Annabelle: LOOK Momma! I can’t eat them now! However, what she didn’t realize is that the tray was clean… so Momma just fed her off the tray. She was a big chagrined after that. Clinic visit today. Please pray for good lab results and just a good visit overall! Oh, and remember baby Scarlet I asked you to pray for a week or so ago???? SHE IS GETTING HER HEART TODAY!! Her Momma updated Facebook late last night that they’d gotten their heart call! THANK YOU JESUS! Please pray for little Scarlet today as she gets her new heart, for few complications, and that her body can recover for any damage her old heart may have done. Of course, please keep the donor family in your prayers as well. Reminds me again, of how appropriate the song I posted about on Saturday is. Yeah for fun book titles. Boo for Annabelle not eating. Yeah for a heart for Scarlet! YAY! Congratulations on a fun title for your debut novel! YAYAYAY! for Scarlet getting her heart today. Praying today for that donor family. You would not usually find me interested in reading romance stories. However, I really like the title of your upcoming book. I will be sure to give it a read. Your weeks are sounding much more positive. Just in case you are too close to the situation to notice..I did say weeks and not just days! Teressa… I'm honored that you would branch out of your normal "non-romance" reading and try my book! And yes, sometimes it IS good to step back and see the overall process rather than the day-by-day-need-to-pull-out-my-hair occurrences! Erica… exploring her options… LOVE IT! Katie… Yep, romance and funny, that would be me! HA! Sounds like a fun title. I think it will show prospective readers they can expect a little (a lot?) of fun 'on the side.' Good job!! Title is actually not that important to me. What IS important is the little shpeal on the back of the book. It has to grab me or I'll set it back down every time. I love Christian romance. Romance without all of the bow-chicka-wow-wow!!! Bonus if it makes me laugh. Love the title! It would definitely make me pick up the book and skim through it. I can't wait to read it. I'm so glad to hear the good news about Scarlett. I've been wondering about her and praying for her. I will continue praying for her, her family and the donor family. I'm so happy about Scarlets new heart! I'm praying! Love the new title. Fun, like you and your story. Love hearing that Scarlet is getting her much-needed heart, although my heart goes out to the donor family. Agree with Annabelle. Cooked carrots are not nice. I love that title, Krista, and the book sounds intriguing and fun. I'm glad things are going well for you…you deserve all the joy that comes your way! Oooo, I'm loving the title. It's gonna be a FUN read! I can't wait! I think you are going to be one of my new favorite authors! I love books with a combination of God, humor and romance! 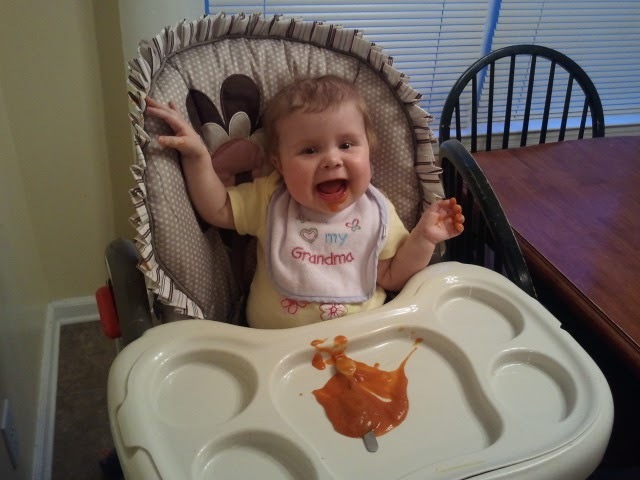 Valerie LOVED carrots and sweet potatos when she was a baby. I lterally turned her skin orange! The picture of Annabelle with the dumped carrots is too cute! She looks thrilled with herself! Praise God for Scarlet's heart!!! I was so sad for her when I heard how sick she was! I can't believe she's getting a heart! Hallelujah! Christin… I am totally a "cover" girl too… when I'm in a bookstore I RARELY read the back of the book (maybe skim) but usually look at the cover to see if I think it's something I might enjoy, then the title. So you're not the only one!! !